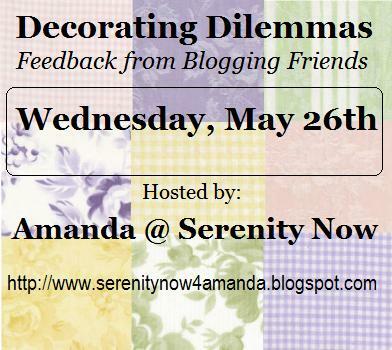 Serenity Now: Stop by later for Decorating Dilemmas! I wanted to invite you (yes, you!) to join me for the next Decorating Dilemmas party! This is a party for bloggers who like to MINGLE! The party will go live after 10 pm (ET) tonight, Tuesday, May 25th; and the link system will stay open all day on Wednesday until 11 pm (ET). That's one whole day of partying! Partygoers are encouraged to visit other links. I found that people who link up earlier tend to receive more comments, and after about a day bloggers move on to the next party. This will be short and SWEET! If you can't make it this time, plan on coming to party for the next round. Here's a button if you'd like to use it. If not, that's fine, but I do ask that you please link directly to the party within your post.